This article was written By Jon Jung on 31 Mar 2011, and is filed under Reviews. Korean cinema is very much an industry of genre films: gangster, high school, melodrama, horror and revenge dramas are the most recognizable but recently, sport movies have also had a significant impact in the Korean film marketplace. I came across Mr. Gam’s Victory as I trawled the internet to find a recommended Korean film that I had never heard of before. I understand that Lee Beom-su has appeared as the star of a few films but I was not very familiar with him, having only seen him as a co-star in My Wife Is a Gangster 3 (2006), and in minor roles in 200 Pound Beauty (2006) and City of Violence (2006). Similarly, I knew nothing about writer/director Kim Jong-hyun. Mr. Gam is Gam Sa-yong, a factory worker who moonlights at a market stall run by his mother and dreams of playing professional baseball. He lives with his mother, his brother and his sister. He is a good worker and is well liked by his colleagues, one of whom is an aspiring actress who is ridiculed by their cohorts. He plays for the company team and learns of tryouts for a professional team, the Sammi Superstars. His co-workers tell him he doesn’t have what it takes to play professionally; he is meek and seems inclined to agree. His mother does not encourage him either. His brother does support him, but seen as he is prone to drinking and gambling, his encouragement isn’t worth much. While on duty in the factory he decides to sneak off and tryout, the wannabe actress sneaks off for an audition at the same time. After a few decent pitches he makes the team. It becomes apparent that the Superstars are far from it and most of the film follows their extended losing streaks. He is not the first choice at base, nor the second, so it takes a while for him to get the chance to play. When this happens it is only to close out losing games, and he does not have the opportunity to make his mark. His chance to start comes during their most important game of the season when they face the OB Bears, who are on a 19-game winning streak , thanks to their pitcher Park Chul-soo, and are looking for another win to break the world record. In typical underdog fashion, only the Sammi Superstars and Sa-yong stand between them and that goal. The film starts off well, the structure is sound, the plot is clear, the characters and their predicaments are all well presented. However, Sa-yong gets to realize his ambition of playing professional baseball very quickly and subsequently the narrative begins to lag. He does not move up the ranks, does not get any chances to prove himself, and the dynamic in his family does not change very much. The climax, which is the extended game against the OB Bears, is much more entertaining, it is also his ‘0ne opportunity’, just like his brother keeps referring to. There are a lot of mirrored character trajectories in the film, namely the fledgling baseball and acting careers of Sa-yong and his co-worker, and the two brothers hopes to strike it big and support their family. Sa-yong and his co-worker skive off for tryouts and auditions at the same time and both make it, although she finds success much quicker. His brother lacks ambition and does not give himself a chance to get his ‘one opportunity’ due to his drinking and gambling. During the final game, which is Sa-yong’s ‘one opportunity’ he gets into a crash at the same time that Sa-yong collides with a player on the field. These three narratives, where each wants to succeed, demonstrate different paths and opportunities. The brother has no specific dream beyond being rich, and therefore cannot attain it. Throughout the narrative he can only live vicariously through the false image he portrays of his brother, this leads him to storm the field and make a fool of himself when this image doesn’t not match the reality. The actress has a very specific dream and works hard to achieve it, although it is hinted that she may have received help due to her ample cleavage. Sa-yong similarly works hard to reach his goals but is thwarted by his slow pitch and a system that won’t give him his ‘opportunity’. Ambition, talent, chance, and physical characteristics all play important parts in determining the ultimate trajectories of these characters. The film begins in black and white and only switches to color when we are introduced to Sa-yong’s siblings, the reason for this being that his brother has purchased a new television and he points out that they no longer have to watch anything in black and white. The previous scenes all feature Sa-yong, in a way it is as if his family is watching him, or at least following his narrative, which will see him end on television. His mother, who disapproves of baseball, also disapproves of the TV. She is older and more traditional; the color set could represent progress and the impending sociological change of the future. In the next scene Sa-yong is on his bed, tossing a baseball up at the ceiling, which is adorned with a poster of an American baseball star. He dreams of playing in America, as it is a symbol of hope and opportunity, a recurring theme in the film. 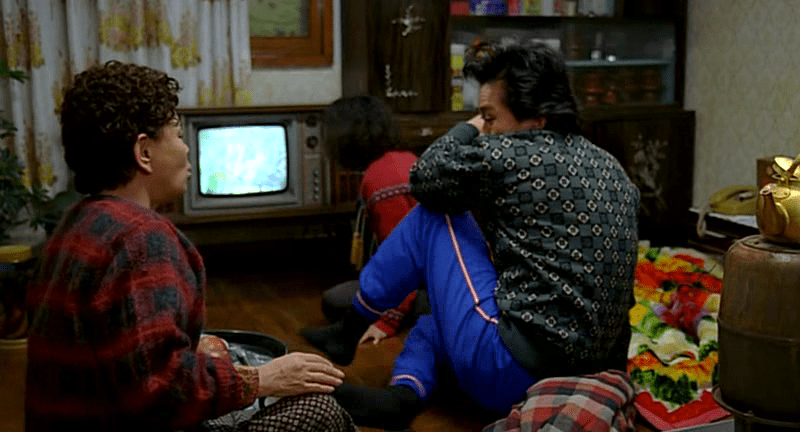 Over on my personal blog I have pointed to the significance of ‘Manly Tears’ in Korean cinema. After losing the big game (the English title of the film is misleading), all the Sammi Superstars exit the dugout, leaving Sa-yong by himself. The OB bears make their exit off the field as well, huddled around and congratulating record-breaking pitcher Park Chul-soo. Sa-yong tries to keep his head down and avoid eye contact with Chul-soo. He raises his head apprehensively and Chul-soo notices him, the rival pitcher nods his head in respect and Sa-yong reciprocates, although awkwardly. When the OB Bears have left the diamond and Sa-yong is by himself, he cries. So what is the significance of his tears? He mutters to himself that he really wanted to win, that he could have won, but I believe other factors are at work in this emotional display. He has worked very hard to reach this point and is no doubt disappointed that he was not able to notch up his first win but it seems like his tears are a result of the wordless interaction he has just had with Park Chul-soo. Despite losing, he has gained his respect. He has overcome the circumstances of his life, which are dictated by the makeup of society, the recognition he has just received proves this. Thus, the tears are a manifestation of the relief he feels having succeeded in tearing himself from the shackles of oppression. The film is set in the 1980s and while it does not go to great lengths to examine the past, it does allude to the political unrest and social dissatisfaction of the time. In one scene, Sa-yong goes jogging past a line of riot police right into a group of rioters which forces him into the middle of the altercation. As is the case for many characters in films of the Korean New Wave of the 80s, the working class protagonists frequently have no control over their own destiny and forced to walk a certain path or risk being cast off from society. Mr. Gam’s Victory is more optimistic however, as after the riot Sa-yong does become a professional baseball player and begins to have a say, albeit a small one, in his own future. The film is based on a true story and is quite modest in its ambitions. This works both for and against it, as the midsection lacks narrative thrust. It is an enjoyable and fresh take on the baseball film that embraces certain clichés but wisely sidesteps many others. Most significant perhaps is that Sa-yong is not a great pitcher, he is merely decent, but nonetheless his love of the game carries him through to the big game of the final act.